The Safer Roads Fund was established to treat the 50 highest risk local A road sections in England with remedial road safety engineering interventions. As a result £100 million has been committed by the Department for Transport across 48 schemes. 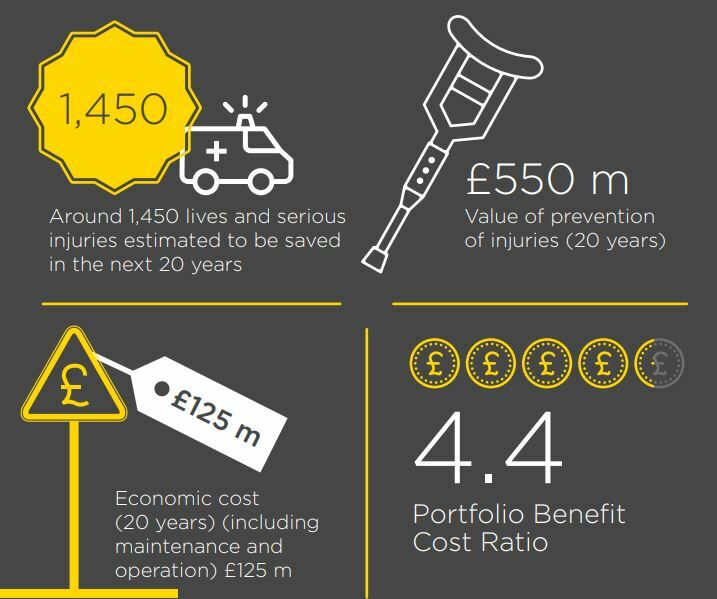 Together these schemes are set to prevent around 1,450 fatal and serious injuries over the next 20 years. The value of prevention for the schemes is £550 million compared with the whole life cost of treatments of £125 million. The Benefit to Cost ratio for this portfolio of roads is 4.4, meaning that for every £1 invested, £4.40 is returned in terms of societal benefit. This demonstrates how road safety interventions can compete favourably with other major transport projects.